I hate walking into a client’s facility to take a look at their insulation setup and seeing something like the picture above. Why? Because improper insulation—whether it’s due using to the wrong materials or whether the insulation is missing, damaged, or poorly installed—leads to increased energy use for facilities. I hate to see companies lose money on energy costs when the solution is an easy one. Here are some examples of the kind of energy cost savings that can occur when insulation is repaired or replaced. MeadWestvaco in Silsbee, Texas commissioned an “Insulation Strike Team” to go through their plant to repair areas of poor, damaged or missing insulation. They determined that reducing insulation heat loss by 10% would yield savings of over $486,000 per year. Bayer CropScience in Institute, WV discovered that by improving and replacing missing or damaged insulation on their steam and condensate lines, they could have a potential savings $926,000 per year. *Examples from the Department of Energy “Save Energy Now” assessments. 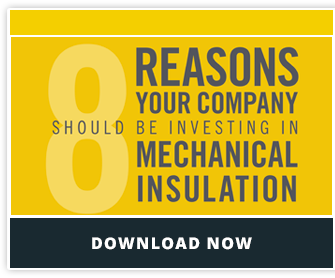 The energy savings in the above examples may be out of reach for small to medium sized facilities, but the facts still illustrate the point that mechanical insulation plays a significant role in energy cost savings. But when I talk about the “true cost” of poor insulation, it’s not just related to increased energy costs. There are many areas of a plant or facility that poor insulation can impact. The examples above highlight the dangers of poor insulation, and each one will lead to significant repair costs if they become a problem. One reason many people choose not to repair or replace damaged or missing insulation is because of the potential cost or manpower lost. In order to get the full benefits from your mechanical insulation system, it needs to be properly selected, installed and maintained. Leaving poor insulation as it is will only cause more costly issues down the road.